It has been two weeks since Android 4.0.3 started rolling out to the Transformer Prime, which made it the first tablet to officially receive the update. With a new version of Android, be it incremental or not, comes new and improved GApps, most of which we've already taken a close look at. 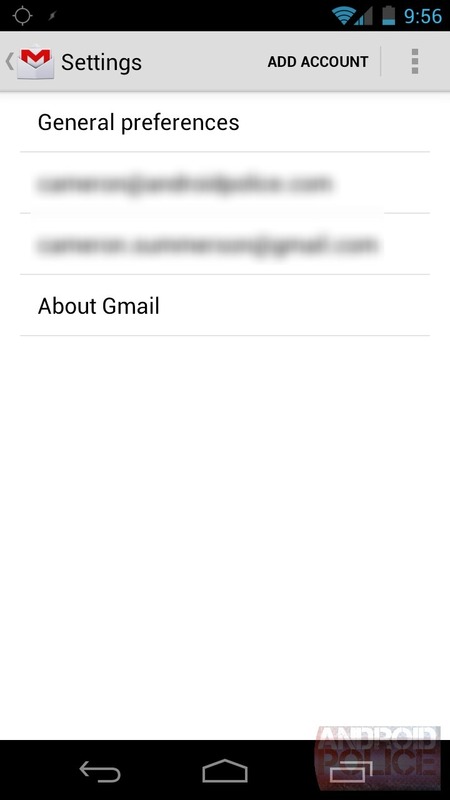 In Android 4.0.3, however, a new Gmail feature has been uncovered by ComputerWorld that is noticeably missing in its 4.0.2 brother: experiments. Sounds dangerous, no? As you can see, these "experiments" is really just a couple of useful options that someone at Google probably deemed "worth including, but not entirely stable." The first option, Enter full text search, is pretty self explanatory - it indexes full messages, which allows you to search through all of the text for keywords; a useful feature indeed. The second feature, however, isn't so obvious. Contact chip? 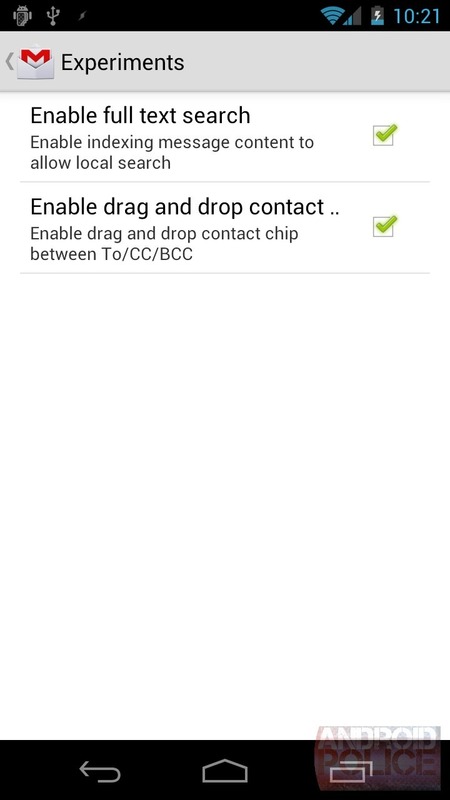 What the heck is a contact chip? When you create a message in previous versions of Android, the name you enter into the "to" or "cc/bcc" fields was basically just text. In ICS, however, those names become items, complete with the person's associated image (from Gtalk, G+... wherever) - that's the contact chip. 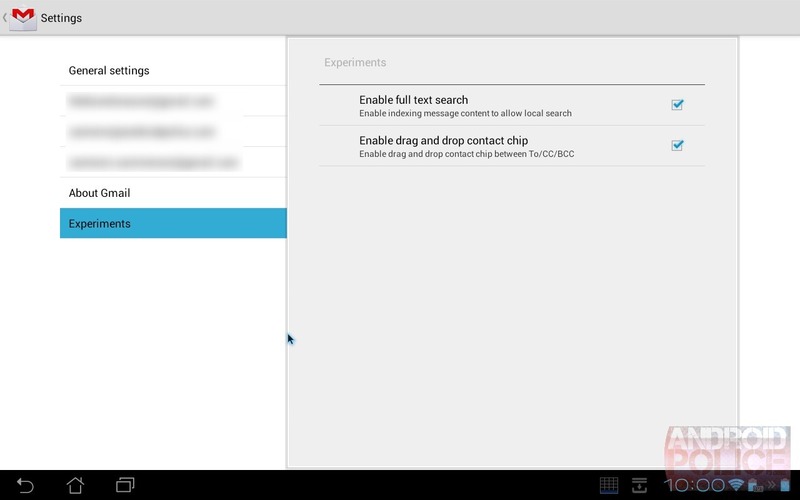 With the second of these experimental features, you can long press on the chip and drag it to another field. For example. 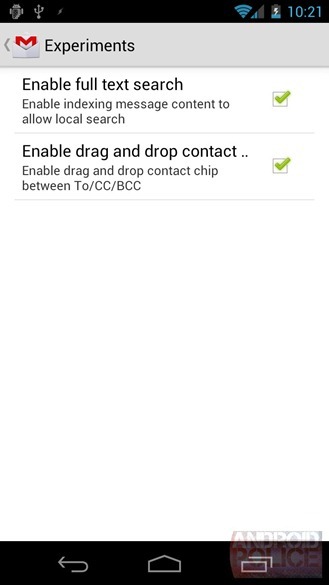 If you accidentally add two contacts to the 'To' field and want to CC one instead, you can simply long press on the contact name and drag it down below. A pretty good idea indeed. 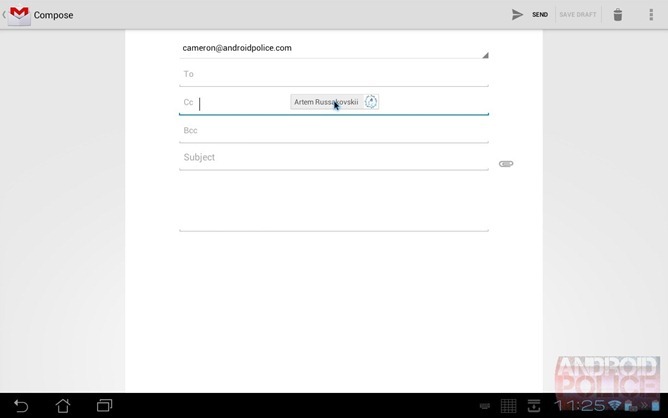 Left: The stock 4.0.2 Gmail app on the Galaxy Nexus (No 'Experiments'); Right: The 4.0.3 apk from the Transformer Prime. Experiments! So, when you can expect to see these features on your Galaxy Nexus? How about right now. 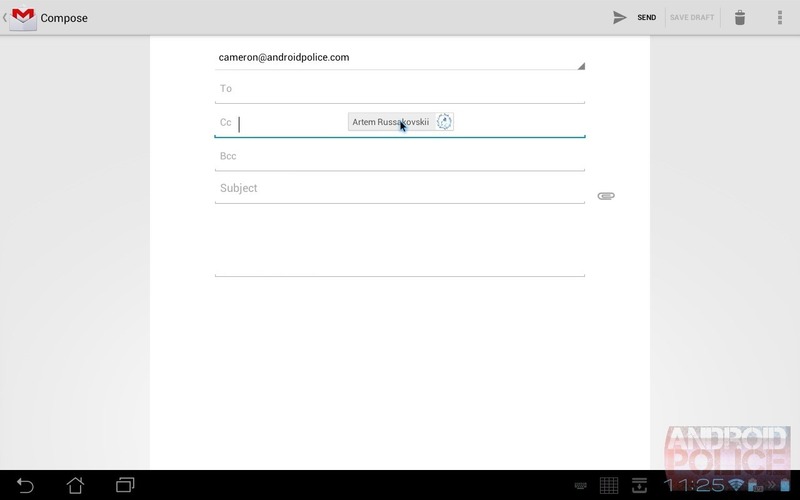 We extracted the Gmail.apk from the Prime and pushed it onto the Galaxy Nexus to see what would happen. As expected, it worked like a champ. Install it just as you would any other app and you're good to go -- if you start to experience any odd behavior, you can always uninstall the update and rollback to the stock Gmail app. Update #1: We just tried it out on Honeycomb (3.2) and it worked just fine. Update #2: The apk <uses-sdk android:minSdkVersion="13" android:targetSdkVersion="14" />, meaning Honeycomb 3.2 is an absolute minimum. Update #3: Gmail runs on 3.2, but force closes upon opening emails, so we wouldn't recommend installing it on 3.2 after all (go to Settings > Application > Gmail > Uninstall updates to revert if you've already installed it). This is for ICS only.